It’s inevitable that, as stories are told throughout time, they are slowly changed to adapt to new social conditions and audiences. Nowhere is this more apparent than with fairy tales and fables, which often undergo quite dramatic changes. You only have to look at how Disney-fied many stories are today- in stark comparison to the dark and often morbid tales of Charles Perrault, the Grimm Brothers, Hans Christian Andersen and their peers. Neil Gaiman- a prolific writer of fantasy for both adults and children, and the much acclaimed writer of several award-winning stories- has recently released a new adaptation of Sleeping Beauty, adding his own unique twist to the beloved fairy tale. Also, featuring characters from another much-loved tale, Snow White and the Seven Dwarfs, Gaiman completely turns the plot of this story around. True, there is a young girl sleeping in a tower, cursed to sleep forever after pricking her finger on a spindle. True, there is an impenetrable wall of roses and thorns surrounding said tower, and all who try to breach the walls and kiss the princess awake are doomed to die. 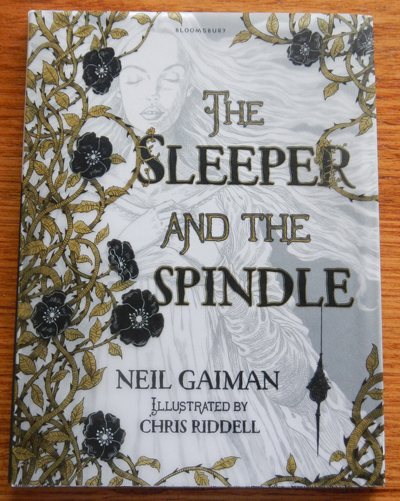 But not everything is as it seems, and Gaiman’s unique storytelling, along with fantastic line drawings from illustrator (and author) Chris Riddell, help to bring this readapted tale alive. As mentioned earlier, this is not your usual fairy tale adaptation. There is no Prince Charming in this story, rescuing the damsel in distress; instead, there is a determined young queen, zombie-like villagers and a unique twist at the end that you probably won’t expect. Although this is a fairy tale, and is produced in a hardcover picture story format, some of the content may not be considered suitable for younger children. Therefore, this book is probably best suited for older readers. The black and white pen illustrations, highlighted with patches of gold, are a treat, and really add to the dark and unusual styling’s of the book. This is a satisfying read for lovers of Neil Gaiman’s quirky characters and lovers of fairy tales in general, and fans won’t be disappointed. An eerie and beautiful book! You never know what you'll get with Neil Gaiman, but it's rarely kid-friendly. Or boring.